KELLY Patrick (Paddy), February 9, 2019 in RVH surrounded by his loving family. Beloved husband of Maureen, father of Deirdre, Patrick, Kevin and Maureen, grandfather and great grandfather. Paddy will be leaving his home, 2 Burnaby Walk on Wednesday February 13th for 10.00am Mass in St Paul's Church, followed by cremation at 1.00pm in Roselawn Crematorium. 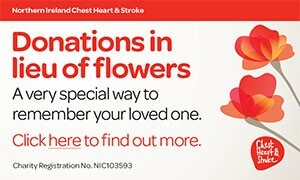 No flowers please, donations in lieu to Friends of the Cancer Unit, Belfast City Hospital. St Charles of Mount Argus pray for him. I am sorry to tell you that Patrick (Paddy) KELLY has passed away.